As long as it is healthy and functioning properly, the low back can withstand tremendous forces without injury. However, if the low back is deconditioned, has weakened supporting muscles, or is out of adjustment something as simple as carrying a bag of groceries, lifting a small child out of a crib, or even simply bending down to pet the dog can cause a low back injury. The susceptibility of the low back to injury and pain is due to the fact that the low back, like the neck, is a very unstable part of the spine. This instability allows us to have a great deal of mobility to touch our toes, tie our shoes or pick something up from the ground, but at the cost of increased risk of injury. There are many different conditions that can result in low back pain, including: sprained ligaments, strained muscles, ruptured discs, trigger points and inflamed joints. While sports injuries or accidents can lead to injury and pain, sometimes even the simplest movements, like picking up a pencil from the floor, can have painful results. In addition, conditions such as arthritis, poor posture, obesity, stress and even kidney stones or bone loss can lead to pain. Due to the fact that there are a whole lot of things that can cause low back pain, and some of those things can be quite serious if left untreated, it is important to seek professional help. 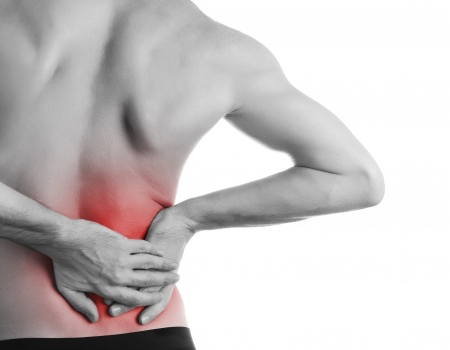 Chiropractors are the experts at diagnosing the cause and determining the proper treatment for low back pain. When joints become stiff and movement becomes restricted, joint dysfunction will usually follow leading to improper posture and poor biomechanics affecting the lower vertebral column’s alignment. This disruption in the normal movement or position of the vertebrae (subluxation) will usually result in pain and inflammation. In the lower back, these commonly occur at the transition between the lumbar spine and the sacrum. Subluxations can lead to debilitating low back pain. Fortunately, subluxations are easily treatable and often times a significant reduction in pain is experienced almost immediately after treatment. Intervertebral discs are cartilaginous structures that are found between the vertebrae in the spine. These discs serve many purposes, including allowing movement of the spine, creating space between the vertebrae, and acting as shock absorbers. Trauma, repetitive stresses, obesity and arthritis are common causes which can cause the discs to herniate, bulge, become displaced (slipped disc), or even rupture. Contrary to popular belief, a herniated disc does not automatically mean that you are going to suffer from low back pain. In fact, one study found that almost half of all adults had at least one bulging or herniated disc, even though they did not sufferany back pain from it. On the other hand, herniated discs can be a source of intense and debilitating pain that frequently radiates to other areas of the body. If you suffer from a disc injury, you should see a chiropractor. Surgery is risky, expensive, and requires recovery time. In many cases, you can experience relief through chiropractic care, a more conservative approach to disc problems. By properly aligning the spine, pressure can be relieved on nerves and on the discs themselves. This will reduce and hopefully eliminate your pain and discomfort and allow you to live a normal lifestyle. Sprains are injuries to ligaments. Strains are injuries to muscles and tendons. And spasms are involuntary contractions of muscle tissue, usually as a response to an injury. The causes of these injuries can vary from a single traumatic event, to a history of repetitive activities that put stress on these body tissues. Whatever the cause, muscles, tendons and ligaments in the low back can get microtears leading to tightness, spasm, swelling, and loss of range of motion. These are common culprits of low back pain and when accurately diagnosed and treated respond very well to chiropractic care.